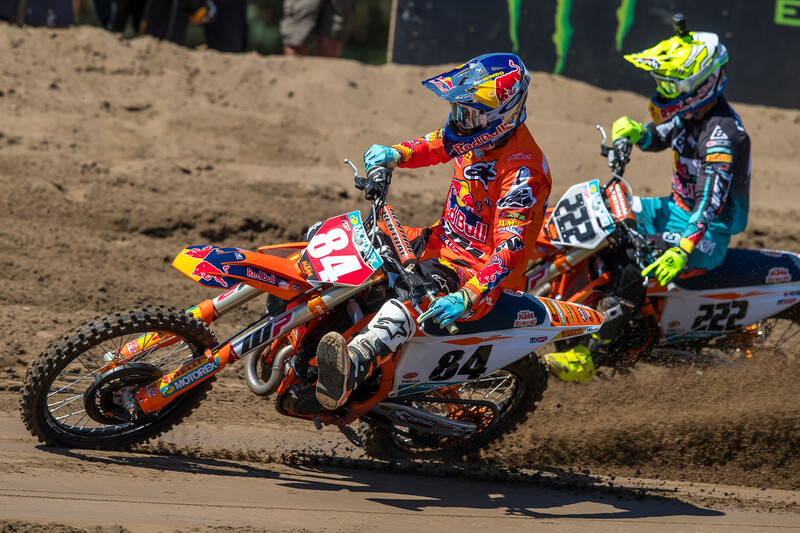 Aussies battle through demanding grand prix at Lommel. Red Bull KTM Factory Racing’s Jeffery Herlings has continued his dominance in the 2018 MXGP World Championship, collecting two race victories at Lommel’s 15th round of the series in Belgium. The current points leader was unstoppable in the deep sand, defeating teammate and reigning premier class champion Antonio Cairoli (Red Bull KTM Factory Racing) in both outings, bridging a 33-second gap in the final moto of the day. A pair of fourth place finishes granted Rockstar Energy Husqvarna Factory Racing’s Max Anstie the final spot on the podium as he edged out Romain Febvre (Monster Energy Yamaha Factory Racing) and Glenn Coldenhoff (Red Bull KTM Factory Racing). 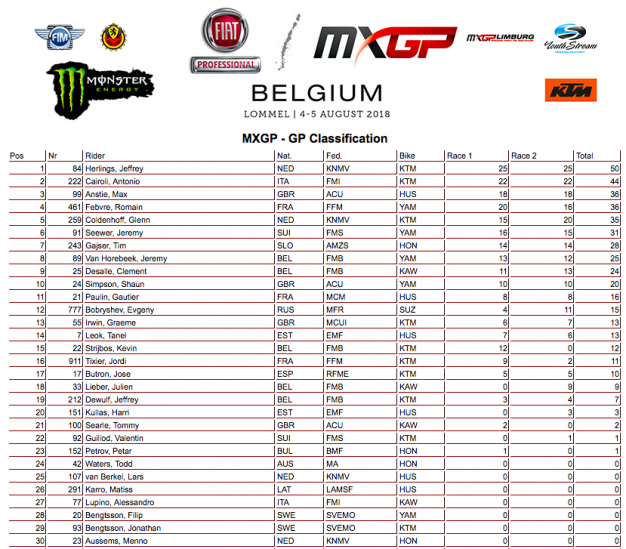 Febvre tied on points for third, however was handed fourth on countback as Coldenhoff fell just one point shy of the duo. Australian Todd Waters (Honda HRC) pushed through an enduring grand prix to wind up 24th overall with a 26-21 scorecard. In the MX2 category, youthful talent Jorge Prado (Red Bull KTM Factory Racing) earned two commanding moto wins for the overall, strengthening his points lead in the process. Rockstar Energy Husqvarna Factory Racing duo Thomas Covington and Thomas Kjer Olsen were second and third respectively, followed by Jago Geerts (Kemea Yamaha Official MX2) and defending champion Pauls Jonass (Red Bull KTM Factory Racing). Aussie contender Hunter Lawrence (114 Motorsport Honda) was credited 13th overall after positing 16-12 race results. 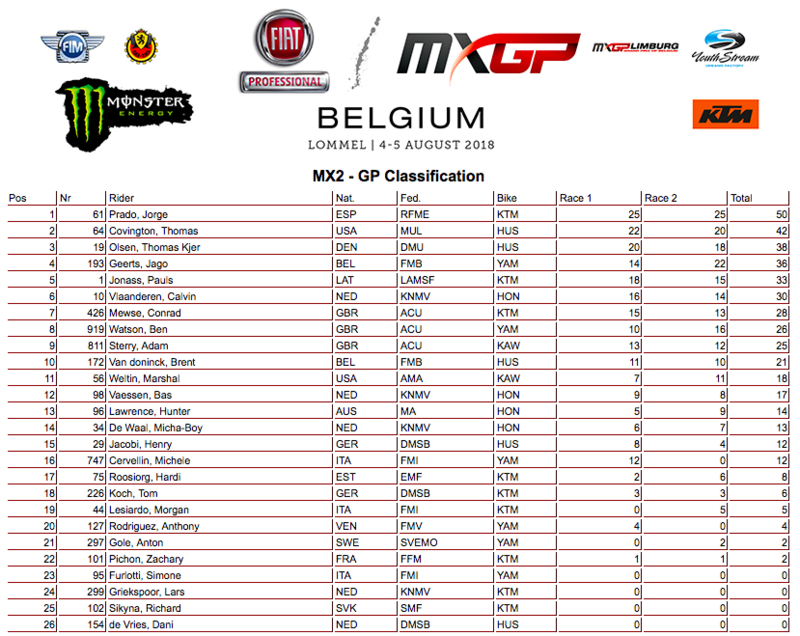 Compatriots Jett Lawrence (Suzuki) and Caleb Grothues (Yamaha) contesting the EMX250 class of the European Motocross Championship were 13th and 18th respectively. Lawrence was fourth in the opening affair while the round marked Grothues’ best finish of the season. The MXGP World Championship will now head to Frauenfeld in Switzerland for the 16th round of the series on 19 August.